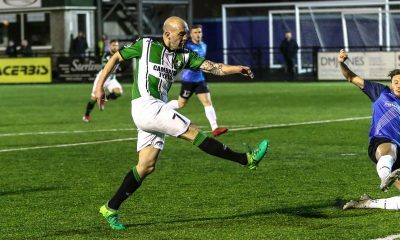 ON a wet night when Aberystwyth Town paid fitting tribute to their greatest ever goalscorer, David “Dias” Williams, the Black and Greens did him proud by earning a vital 3-2 victory which keeps their quest for a UEFA European Play Off alive going into the last five matches of 2018/9. Ryan Wollacott tapped in Town’s opener on 6 minutes, and just five minutes later Geoff Kellaway blasted home a second. 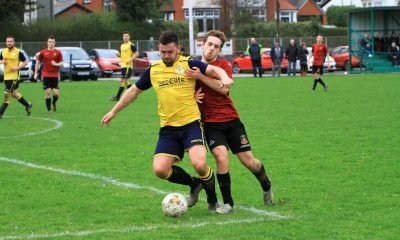 Luke Bowen brought Carmarthen back into it on 28 minutes, and the visitors pressed for long periods only for an own goal from Lee Surman to make it three-one with 22 minutes remaining. 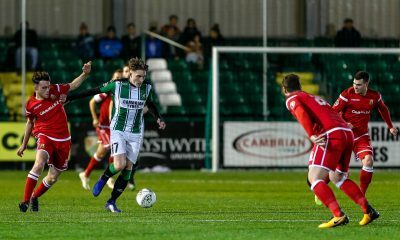 Liam Thomas pulled one back in the 81st minutes but Town held on for a big win which keeps Aber in eighth place and equals last season’s tally of 37 points with five games to go. After their fantastic win over Cardiff Met last time out the Black and Greens made one change with young keeper Adam Walters coming in to make his debut in place of Terry McCormick. After sitting deep the hosts enjoyed a dream start when Wes Baynes’ deep cross fell for Declan Walker, and his low shot was parried by Lee Idzi right into the path of Wollacott, who tapped home from close range. Geoff Kellaway then burst through down the right and hit the side netting, but the visitors were not so lucky on eleven minutes when Kellaway played a beautiful one-two with Ashley Ruane before slamming home yet another Gol y Mis contender first time from out on the right. Town now looked supremely confident passing the ball round, though to be fair to Carmarthen Mael Davies sent one effort over the bar, and Luke Cummings brought a smart save out of Walters. Ruane almost capitalised on a sloppy back pass but then Cummings again burst down the right and crossed for Bowen to tap home a response, and the visitors were right back in it just before the half hour. 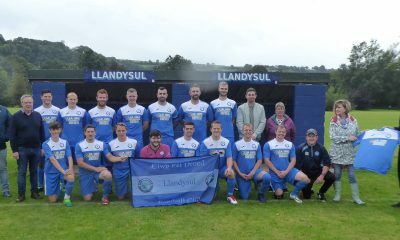 Walters in Aber’s goal twice denied his namesake Greg Walters, and Wollacott pulled off a great tackle to deny a goal, while at the other end Kellaway just failed to control a super ball from Mattie Jones, and Steff Edwards went wide also. In injury time Carmarthen’s Liam Thomas headed wide from a free kick in a dangerous area and an entertaining half ended with Aber ahead thanks to some clinical finishing. 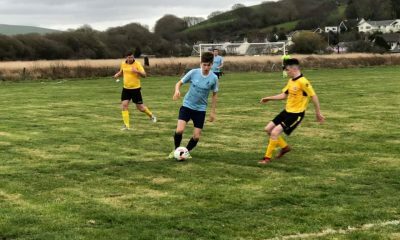 Carmarthen dominated the early stages of the second half with Aber sitting back on their lead, and some determined tackling from the likes of Paolo Mendes and Man of the Match Declan Walker restricted their chances. Walters sent a shot wide, Lee Surman glanced a header over from Cummings’ free kick, Liam Thomas tapped wide from Jordan Vickers’ cross and Vickers’ shot from out wide was touched home from a corner. It was becoming clear that the next goal would be crucial and Mattie Jones’ surges down the left were resulting in some dangerous crosses, one of which just evaded Ruane. The ever industrious Marc Williams turned on the edge of the area and curled an effort just over, and then another excellent cross from Jones skewed into the back of the net off the unfortunate Surman’s foot for the killer third goal, and Aber were surely safe. 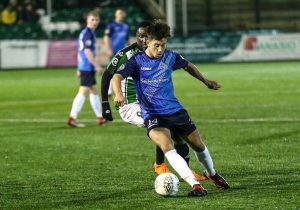 There was however a quarter of the game still to play and although Mendes hooked over from a corner it was a rather nervous ending to the game for Aber. Walters saved from Bowen but then with nine minutes left Thomas made the most of a defensive mix up to cut the deficit once again. The hosts however defended stoutly through the remaining nine (plus five) minutes, and Mattie Jones, picked for the Wales C Squad in midweek, could have even capped a super few days with a goal when Kellaway played him in, but with the Dias Stand primed to celebrate, his shot skewed just wide. It did not matter however, Aber held on for another crucial victory. 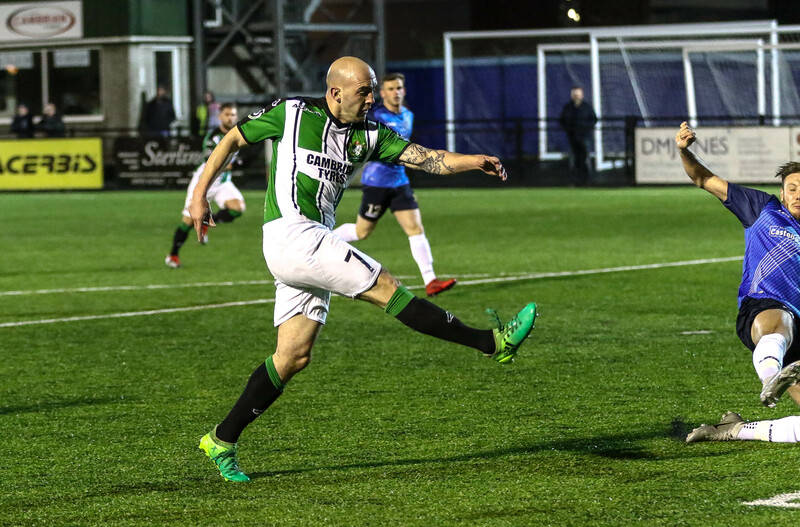 The Black and Greens are enjoying life in the Play Off Conference and ten points since the split is equalled by only one other Club in the whole League, namely leaders Connah’s Quay Nomads. 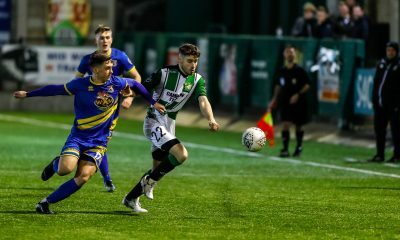 If Aber can keep up their super form they could be looking at a very exciting end to the season, with a UEFA Europa League Play Off place up for grabs. Matchday 28 takes Town up to Llandudno on Friday, March 22, (ko 7.45pm).